My attempt at roast chicken ends with a couple of mistakes, but it still turned out delicious! Check out the recipe and video after the break. First prepare the herb butter by mixing 1 TBS of minced fresh thyme leaves, the zest of a whole lemon, 1 TSP of salt and 1 TSP of freshly ground pepper. Make sure the butter is room temperature before mixing, or else you’re going to have a hard time. You can put the butter in the microwave and heat it up at 15 seconds, checking on it every time, to soften it. Once you have the butter done, put it aside and proceed with separating the skin from the breast with a spoon. Go slowly making sure not to break the skin in the process. Stuff the herb butter on each side once you’re done and smooth the butter flat underneath the skin by press your fingers against it. You will want to generously salt and pepper the inside of the cavity with about 1 TSP of each. Give the inside a good rub to make sure it is properly seasoned. Pat the chicken dry with some paper towels, this allows the wet rub to stay on the chicken. Next we’ll move onto making the wet rub for the chicken. Grab a pestle and mortar and add 2 sliced garlic cloves, 2 TBS of fresh thyme leaves, the zest of a whole lemon, 2 TSP of salt, and 1 TSP of pepper. Grind the ingredients until it looks like a thick past, add the juice of half a lemon and continue grinding until it is smooth. Pour in 1 TBS of oil, stir until it is incorporated and spoon it over the chicken. If you do not have a pestle and mortar, you mince the garlic, lemon, thyme and then have it sit in the oil with the rest of the seasonings for 15 minutes before rubbing it on the chicken. Chop the vegetables roughly, and mix them with the seasonings in the roasting pan. You don’t need too much oil, as you already have the oil and butter from the chicken dripping down. Stuff the chicken with a couple cloves of garlic, thyme sprigs and lemon wedges. Then tie the legs up and place it on the vegetables. Place two bay leaves underneath the chicken and put everything into a pre-heated 375F oven, for 1.5 hours or until an internal temperature of 180F at the thickest part of the chicken. If you’re not sure if the chicken will be thoroughly cooked, you can start the roast with the back of the chicken facing up for about 40 minutes, flip it over and finish it for about 1 hour or so. Piercing the thickest part of the chicken and seeing if the juice is running clear is a good way to tell if it’s done. Or a crazier method would be to get a paring knife and stick it the thickest part of the chicken for a couple of seconds, take it out and see if the tip of the knife is hot against inside part of your arm. Once your chicken is thoroughly cooked through, take it of the oven and put aside to rest. Pour the drippings into a sauce pan, if you used a cast iron pan take everything off and put it on the stove over medium to medium low heat. Skim the fat of the drippings and add a TBS of flour to thicken the gravy. Whisk the flour for a minute or so, and then add any other juices from chicken as well as the some lemon juice from the roasted chicken. Make sure to add the lemon juice in small portions so it doesn’t get too tart. Give a splash of water or chicken stock, and season to taste with salt and pepper. This is my first attempt at making lemon thyme chicken. I was inspired to make it after I tried it at my friend’s house, and I thought it would give it a go. I researched a bunch of different recipes online and took all the things I liked. One thing I found while searching online was adding the butter under the skin, I thought it was a very cool way to add flavour while keeping the chicken moist. Another trick I discovered was using a cast iron skillet instead of a pan, though this was definitely for the aesthetics only. A roasting pan would do the job just fine, maybe even better since you can add more vegetables under the chicken, But the skillet ended up giving the picture a rustic look with the cutting board and dark table, so I consider that a win. I don’t consider myself a chef of any sort since I’ve never been trained, but I am confident with my cooking skills. So I approached this recipe with gusto thinking “how hard could it be?” Like in movies, whenever someone says that everything goes horribly wrong. Everything that should have been easy wasn’t, and things I didn’t expect to be a problem turned out to be a huge disaster. I learned a huge lesson making this chicken. Don’t test your recipe on the day you’re filming! Which led me to filming this recipe twice since I’m an idiot. – I didn’t think everything through, so whenever I handled the chicken and then needed to check the camera for focus I would have to wash my hands. I realize now that having me handing the chicken in one continuous shot might have been easier. 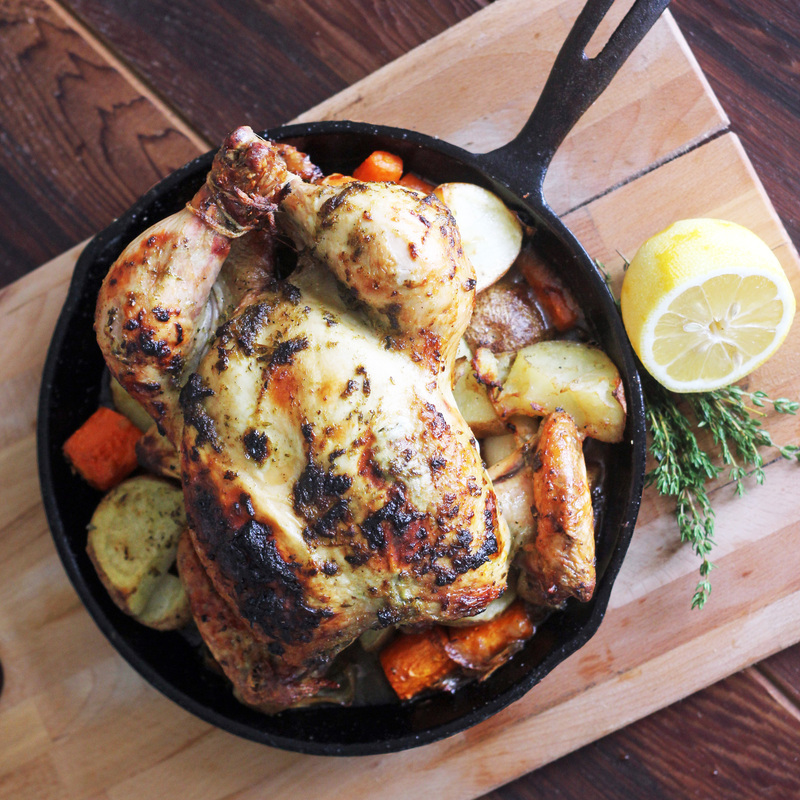 – In the first attempt I made a lot more herb butter so I could rub the outside of the chicken with it. But I didn’t pat the chicken dry (which is why that tip is in the video) so the butter just slid around, not sticking. – I added lemon juice to the butter, but had a hell of a hard time incorporating it into the fat. – The chicken wasn’t even fully cooked on my first attempt (hence the flipping tip on the recipe), so I had to change the cooking time. – I used a huge pan with vegetables on the first chicken and they soaked up all the juices, leaving me with very little to make a gravy. – I added flour to the gravy way to late (as shown in the video), and ended up with clumps. – I added way too much lemon juice into my gravy and it came out super sour. But after I fixed everything, the chicken tasted very delicious. It was very juicy and succulent, and you could really taste the herbs in the meat. The gravy was tart but savory which went very well with the vegetables. I hope you give this recipe a try! If you have any comments, tips or suggestions please leave it in the video.